Over recent years, thousands of patients across Canada have received dental implants. Implants are quickly becoming one of the leading restoration options for those seeking an alternative to dentures. 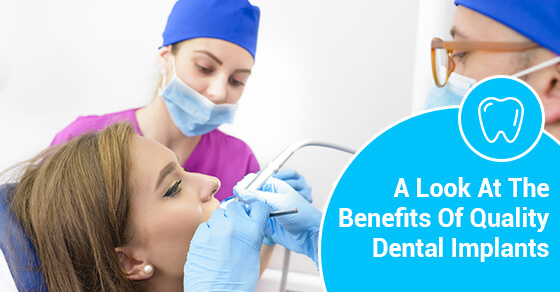 To help highlight the improvements dental implants can bring to the patient and their lifestyle, this latest post looks at the core benefits of quality dental implants. One of the leading benefits of dental implants is that they can help the patient maintain their facial structure over time. Some denture wearers find that their face becomes sunken or their lower face begins to sag, resulting in enlarged jowls, due to the lack of underlying bone structure within that area of the face. Dental implants work to ‘trick’ the body into thinking there is a natural tooth root. This helps to prevent bone loss over time and stimulates the area, keeping the bone and jaw intact. The patient keeps the natural appearance of their facial structure and it improves the functionality of their teeth. When a denture patient goes out for a meal, they are sometimes filled with concern that they won’t be able to enjoy the night because they are worried about how they will consume the food. Dental implants help take away this worry. Because they offer the same level of functionality and strength as natural teeth, patients can use their teeth naturally when out in public. Nobody knows they’re wearing dental implants! Rather than having to take out their dentures every evening and keep them in a solution that prevents degradation, implant wearers can simply care for the implants the way they would with their natural teeth. They can follow the same cleaning and flossing process as people with natural teeth to keep the implants in optimal condition. Speaking with their dental implants is easy for patients. There are no more slurred words and confused looks associated with trying to speak when wearing dentures. Patients can simply enjoy their time with family and friends without being worried about how they appear when they speak. Our trusted oral health professionals are ready to help guide you forward in undergoing dental implant treatment! To learn more on the advantages implants can have on your life, speak with our expert team directly!